The best way to finish a perfect mowing job is to neatly trim the places in your yard that you didn't reach with your mower. 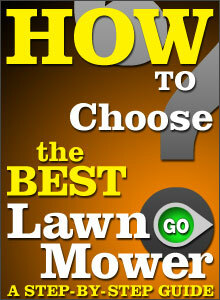 The size of your yard and the thickness of your weeds play a huge part in choosing a trimmer. Different trimmers are used for lighter jobs, heavier jobs, and some even have detachable shafts for multiple jobs. So give your mower the sidekick it needs! Learn about each trimmer type below. Before choosing your shaft type, determine what you need your trimmer for. If you have a larger yard, fences, obstacles, and hard to reach places, or you're a diehard commercial user, a straight shaft might be a good idea for you. If you're a residential home owner that needs to do some light trimming now and then, you may want to consider a curved shaft. Straight shaft trimmers are good for hard to reach places such as under decks, behind trees and around fences. These shafts put more distance between the ground and the operator for better reach, and less risk of kickback debris. Many homeowners find curved shaft trimmers easier to operate. Curved shaft trimmers provide more control and are typically lighter in weight. They are easier to maneuver around flower beds and sidewalks. Curved shaft trimmers are usually more comfortable to hold, making it more manageable for any homeowner, big or small. Attachments can include edgers, brushcutters, hedge trimmers, and more. 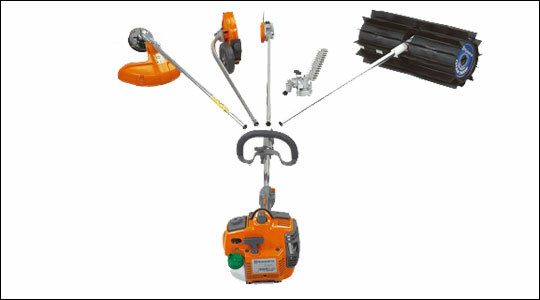 One string trimmer can replace a garage full of other trimming power equipment! With just the swap of the shaft, a split shaft trimmer can transform into several different equipment types, saving you time and money. These attachments include: a leaf blower, edger, brush cutter, hedge trimmer, pole saw, clean sweeper and several more. These trimmers can multi-task to assist you in getting a lot of work done without purchasing multiple machines. Walk-behind trimmers are similar to a push lawn mower. 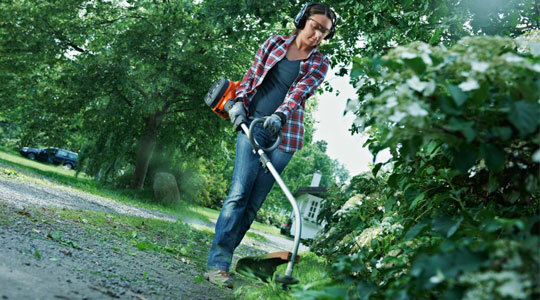 These trimmers are good for increased mobility to tackle overgrown areas and large amounts of weeds. Large wheels handle rugged terrain. 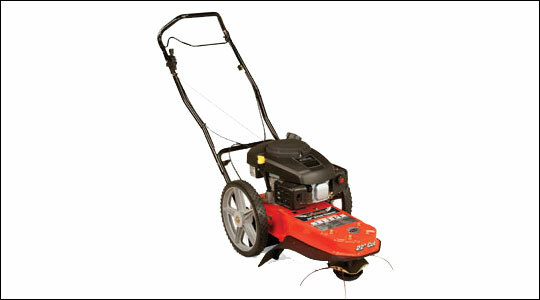 Most wheeled trimmers have 4-cycle engines, just like a push mower. Wheeled string trimmers are often recommended for commercial use or on lawns where an overabundance of weeds are found. For meadows, tall grass, and thick growth, use a Brush Cutter. Brush cutters work similarly to string trimmers except they are used to clear dense grass, thick growth, and heavily weeded areas. Many brushcutter users outfit the trimmer head with cutting blades to pack more punch behind each cut. Brush cutters are typically have larger engines for more power than a string trimmer. The straight shaft offers durability and the bike-handle design gives comfort and maneuverability when using the equipment for extended periods of time. The choice between gas, battery operated (cordless), or electric string trimmers is very dependent on your needs and your yard type. Some offer great mobility, some are lighter and some offer an easier start. 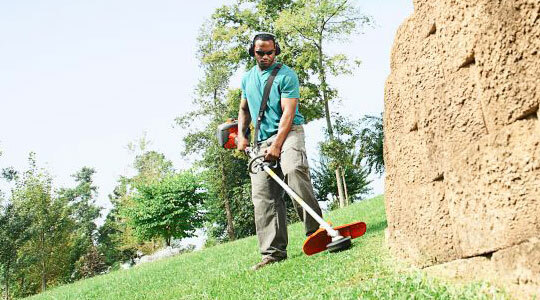 Gas Powered: These trimmers are perfect for any type of growth, thick or thin. Gas trimmers are more powerful, and they offer more mobility in conditions that require longer operating periods. However, they do require more maintenance and are noisier than the other two types of trimmers. 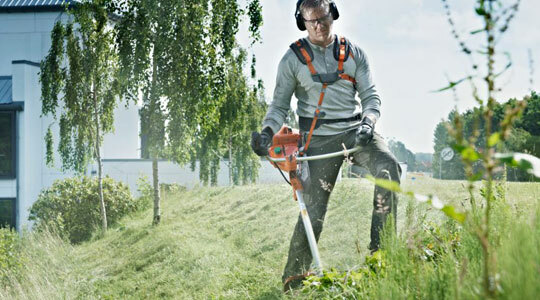 Gas trimmers use either a 2 or 4-cycle engine. Battery Powered (Cordless): These trimmers offer cord-free mobility, so you don’t have to worry about the size of your yard. These trimmers require no maintenance, no fueling, fumes or pull starting. These trimmers can only run for approximately 30 minutes before the battery needs to be recharged for multiple hours. They’re emissions free, on-the-go machines you can easily pick up and trim your yard without the hassle of gas-related issues. Electric Powered Trimmers: Electric powered trimmers are recommended for smaller jobs. These tend to cost less and don’t require tune ups. Electric powered trimmers are equipped with a push button start, eliminating the recoil of the gas powered models. These trimmers are almost maintenance free and are quieter than the gas models. However, you are limited in range when it comes to cord length. When choosing your trimmer keep in mind the size of your lawn, the thickness of your grass and weeds, and the comfort you desire. Choosing the right trimmer can get your job done in half the time and help turn your lawn into a perfectly manicured masterpiece. If you have any comments or feedback, please let us know. E-mail us at articles@mowersatjacks.com.